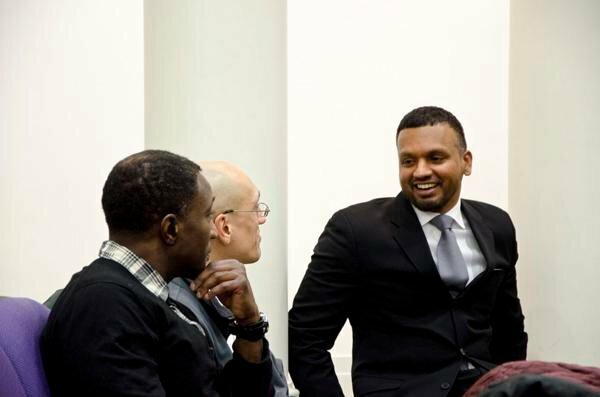 Zaheer Ali, who was part of the Malcolm X project at Columbia University, speaks with (from left) Loyola Prof. Kim Searcy and Evanston resident Eric Basir. Northwestern’s black and Muslim student organizations collaborated Wednesday night to highlight the role of Muslims in American society and their similarities with other ethnicities. As a part of the Muslim-cultural Student Association’s annual Discover Islam Week, the group collaborated with For Members Only to host Zaheer Ali, who spoke to about 110 students and faculty Wednesday night at Harris Hall. Ali is a doctoral student in history at Columbia University, where he served as a project manager and senior researcher for the Malcolm X Project. His talk, “The Legacy of X: Black & Muslim and the Struggle for Justice,” examined Malcolm X’s life and his surviving influence on black and Muslim communities. To show how various communities claim different parts of Malcolm X’s history, Ali pointed out the United States Postal Service stamp that honored the controversial activist. Malcolm X’s face on the stamp was cropped from a larger photograph of him in anticipation for a meeting to discuss putting the U.S. on trial for crimes against black Americans, he said. Although many Americans view Malcolm X as a civil rights leader who opposed Martin Luther King, Jr., Malcolm X had a larger impact on the idea of geography, Ali said. Ali defined geography as boundaries “defined by narratives” and executed through power. Malcolm X used his faith to create an alternative narrative and geography for blacks, he said. “We must also think about his faith tradition because it’s his faith tradition that largely allowed him to create a counter-hegemonic narrative for Black people around the world,” Ali said. For Members Only invites speakers like Ali every year to commemorate Malcolm X, because he is often overlooked in American history, said Tarik Patterson, FMO’s vice coordinator for external relations. Wednesday’s event was the first time the Muslim-cultural Student Association has cosponsored FMO’s annual Malcolm X lecture. Both organizations said the topic of the lecture made for an obvious and easy collaboration. Some students said recent racial incidents on campus, such as the one involving NU maintenance worker Michael Collins finding a stuffed bear hanging next to his desk as though it had been lynched, have not provoked many collaborations among student cultural groups. Despite this, they said they look forward to more joint events in the future. Correction: A previous version of this story mistakenly referred to Malcolm X as a founder of the Nation of Islam. The Daily regrets the error.